Serums and Ampoules have become a vital step in my skincare routine. They are some of the best products to boost a routine and provide the skin with a concentrated dose of nutrition and care. Think of them as beauty potions; the powerful treatments that can heal damaged skin, provide that healthy glow, and even reverse the signs of aging. I have tried a few serums, ampoules, and even boosters by now but none were my favorite. So the hunt continues. 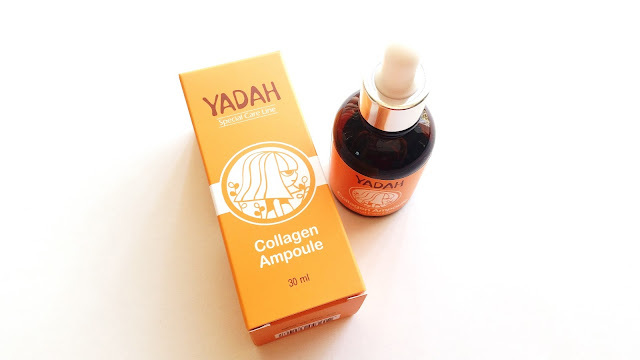 I am currently testing this Yadah Special Care Line Collagen Ampoule and have been using it for over a month. Let's get to know it. Product Description: The Yadah Collagen Ampoule is a highly concentrated product. It is formulated with high concentrations of Marine Collagen and Sodium Hyaluronate which can add moisture to the skin and enhance its elasticity. The ampoule also includes ingredients such as ginseng, green tea, and carrot extract to nourish the skin and provide it with a firmer and tighter complexion. To Use: Cleanse and tone the skin first. Take a few drops of the ampoule (usually 5 drops are enough) and apply it evenly onto the skin. Continue with the rest of your skincare routine. Ingredients: Water, butylene glycol, hydrolyzed collagen, propylene glycol, glycerin, betaine, alcohol, panax ginsend callus culture extract, daucus carota sativa (carrot) callus culture extract, camellia sinensis callus culture extract, chrysanthemum indicum callus culture extract, phaseolus radiatus meristem cell culture extract, bambusa vulgaris callus culture extract, panthenol, niacinamide, arginine, dipotassium glycyrrhizate, hydrogenated lecithin, cholesterol, PED-60 hydrogenated castor oil, carbomer, phenoxyethanol, ethylhexylglycerin, disodium EDTA, hydrogenated starch hydrolysate, glycosyl trehalose, fragrance, raffinose, ceramide 3, phytosphingosine. I thought I would talk a little about Cell Culture here. Cell Culture is a process where cells are grown under controlled conditions. These controlled conditions are usually different than their natural conditions. In the case with phaseolus radiatus meristem cell culture extract (the only cell culture ingredient on the list), the extract is a plant derived stem cell that can heal UV damaged fibroblasts and stimulate cell proliferation. It can also help to prevent inflammation and enzymes that can breakdown collagen while inhibiting new collagen formation. Packaging: Yadah's packaging and brand mascot have this whimsical feel to it. It is fun and youthful. The orange colored packaging really pops too. The box packaging comes with product information in both English and Korean. It is pretty detailed, which is great. The ampoule is stored in a brown bottle with a dropper. This is pretty standard for products like this. Scent: The ampoule has a green tea scent. It is fresh but a little artificial too. Fragrance has been added to the product as well. Color: As seen in the picture below, the ampoule is colorless. Texture: The ampoule is fairly watery. Still, it is thicker than most toners. It is easy to absorb and does not leave behind any sticky residues. Helen's Thoughts: This is my first Yadah product and it was a great introduction to the brand. I have been using this ampoule once a day, every morning, for the past month and some. Theoretically speaking, the 30ml ampoule should last about 3 months if used once a day. I use about 5 drops each time for my face and neck. Since 15 drops is roughly 1ml, the calculation comes out to about 90 days. The time might vary per person depending on the amount of drops you use and how often you use the product. Ampoules and serums are generally fairly expensive for their small sizes. However, since they are concentrated treatments, it is understandable. The Yadah ampoule is formulated with a variety of nourishing ingredients to provide long term care. 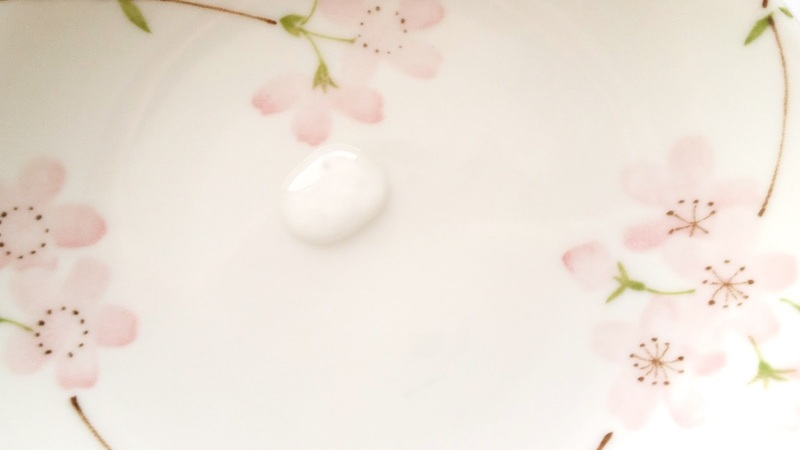 It adds moisture to the skin when applied and leaves the skin feeling soft and plump. The product is light weight and absorbs quickly. Overtime, I have noticed its brightening effects and my face does feel firmer. It is hard to tell if these effects will last even after I finish this product but so far it looks good. Although not promised, the ampoule does help to diminish the appearance of fine lines as well. Some of my fine lines have remained fairly diminished, however, for many the effect is only temporary. I do still have more than half a bottle of this ampoule left. So hopefully, the effects will become more permanent over time. I think this ampoule would be great for those with minimal fine lines, who still want more plumpness and firmness. For me, this ampoule is a great moisturizing and nourishing ampoule but its anti-aging effects are not as strong as I would like. The ampoule also contains certain ingredients like alcohol and fragrance that might not be suitable for everyone. While I am not sensitive to either of these ingredients, it would still be better if the product did not contain them. 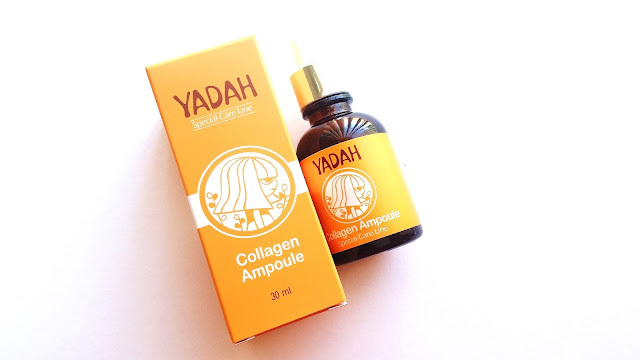 Final Thoughts: Overall, this Yadah Special Care Line Collagen Ampoule has been great. It does fall short on some anti-aging benefits but the ampoule still offers a lot. I like that it is moisturizing, nourishing, brightening, and firming. The ampoule is light weight and I can use it in the morning without worrying about layering other products on top of it. Would I purchase it in the future? I am undecided. I want to see if the anti-aging benefits improves with even longer terms of usage. If it does, than maybe I will consider buying it. However, if the benefits remains lacking like it currently is than I will look else where. Do I think this ampoule is worth a try? For its price, this is a fairly inexpensive ampoule. 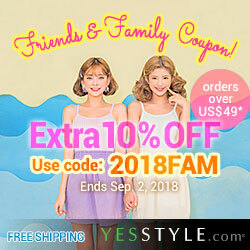 I think it is worth a try for those who only need minimal anti-aging care. If that is the case for you, this ampoule would be a good one to start with.